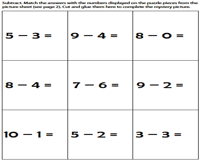 These activity-based worksheets have been designed specifically to help learners of Grades 1, 2, and 3 to grasp the basics of subtraction. Worksheets include attractive cut-and-glue picture puzzles to enhance fine motor skills of children as well. 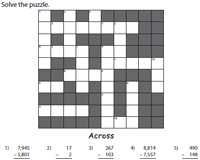 Use the cross-number puzzles for fun-filled assignments! Employ the various download options to access this entire array of spectacular printable resources. Children are sure to be glued to their desks with this series of worksheets! Subtract the single-digit numbers. Match the answers with the puzzle cards. Cut and glue them to reveal the mystery pictures. Teach two-digit subtraction with this fun-packed activity sheets. Find the differences between the two numbers. Pair the answers with the puzzle cards and fix them one by one to unravel the pictures. Get kids to hone their skills at 3-digit subtraction with these popular toons-based worksheets! Use safety scissors to cut out the puzzle cards and glue them to unveil the funny pictures. Clues are provided in the form of 2-digit subtraction. Subtract, find the differences and complete the puzzles. 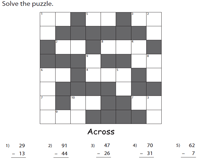 Watch students clamor in the classroom to complete this set of puzzles! Keep little curious minds busy with this series of puzzles that involve 3-digit subtraction. Clues in the form of 3-digit minus 2-digit subtraction are also provided. This makes for a perfect homework assignment. 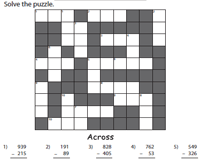 Cross-number puzzles are featured here on 10x10 grids. Solve the clues given in the form of 4-digit subtraction. 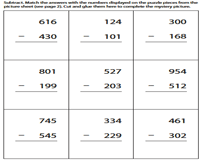 3-digit subtrahends are also provided in this batch of interactive worksheets. 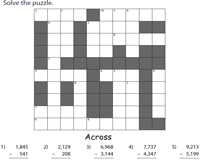 Download this group of print-ready cross-number puzzles that comprise a mix of 1- up to 4-digit numbers. 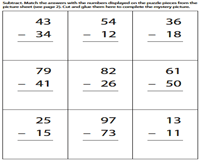 These worksheets form an ideal tool to gauge a child's grasp on subtraction.